← are you going to Scarborough fair? Toronto. Another nifty page turner produced by our Sonja Pushchak. This delightful issue weighs in at 11 pages. 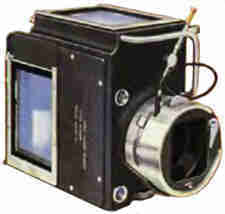 The lead article on Cruise Queen ties in an early use of colour photos in commercial advertising with the illustration of a Vivex 3 plate colour camera. In the pre-Kodachome days, the tri-plate camera was the only way to get reasonably accurate colours and decent resolution for publication. Page 2 announces our speaker for this month. Following that are many gorgeous articles including David Bridge’s Equipment Review. I too once used Paterson tanks and the back-and-forth movement to wind the unprocessed negative strip into the reel. An earlier use of the FR tank used a outside-in loading of the reel and the cupped (crimped) ordeal to load 120 film strips and some times 35mm from the centre out causing some strip touching and developing issues. This entry was posted in newsletter and tagged colour, darkroom, Nikon, Peterson, photos, SS Queen Mary, Vivex camera, wet-plate. Bookmark the permalink.